Commercial Railing | Contact Hohulin Fence Today! 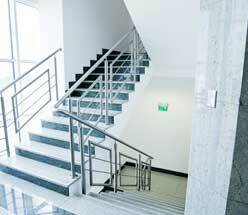 Commercial railing plays a key role in safety and in decoration. Commercial railing doesn’t simply protect your clients and employees from various hazards; it sends a message about how you want your Central Illinois business to be seen. Make sure you are sending the right message with Hohulin’s top-of-the-line commercial railing options. We carry a wonderful selection of aluminum and vinyl railings that will match the sophistication, elegance and charm that you have been searching for. For more than a century, Hohulin provided commercial railing and fencing products to Midwest businesses. Trust the Hohulin name for the highest quality railing products and installation in Central Illinois. See what we can do for your business today! With Digger’s state-of-the-art powder coating facility, they offer AAMA 2604 powder coatings in a variety of satin, fine textured, and multi-colored finishes. Aluminum railing is an economical and maintenance free solution to add sophistication and elegance to your front porch or back deck. Digger offers a lifetime transferable warranty and is made in the USA. Click here for Westbury styles and colors. Does aluminum ornamental railing not match the style of your Central Illinois business? Vinyl may be the solution for you! Digger offers a lifetime transferable warranty and is made in the USA. Click here for Polyrail styles and colors. Contact Hohulin for Your Commercial Railing Needs! For over 100 years, Hohulin has been the trustworthy choice in fencing and related products. 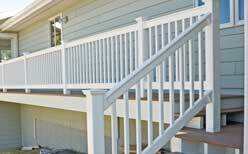 So choose Hohulin for your commercial railing needs. Got a question? Contact us online or call us at 309-316-1008 today! For other commercial fencing products, please visit the following pages: Chain Link Fences & Athletic Fencing, Ornamental Fencing, Rental Panels, Privacy Fencing, Highway Guard Rails, Commercial Gates & Operators and Commercial Railings.